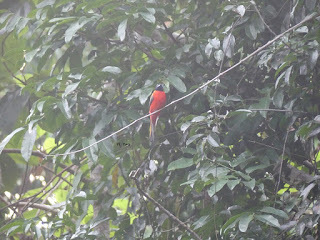 Scarlet-rumped Trogon spotted at eye-level as we were driving out of the forest. 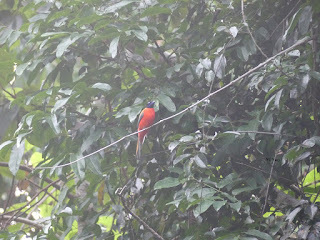 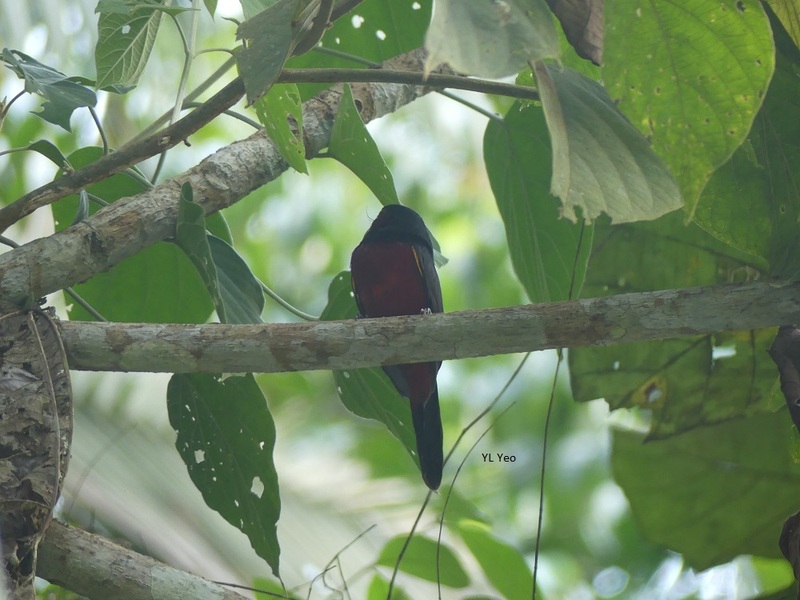 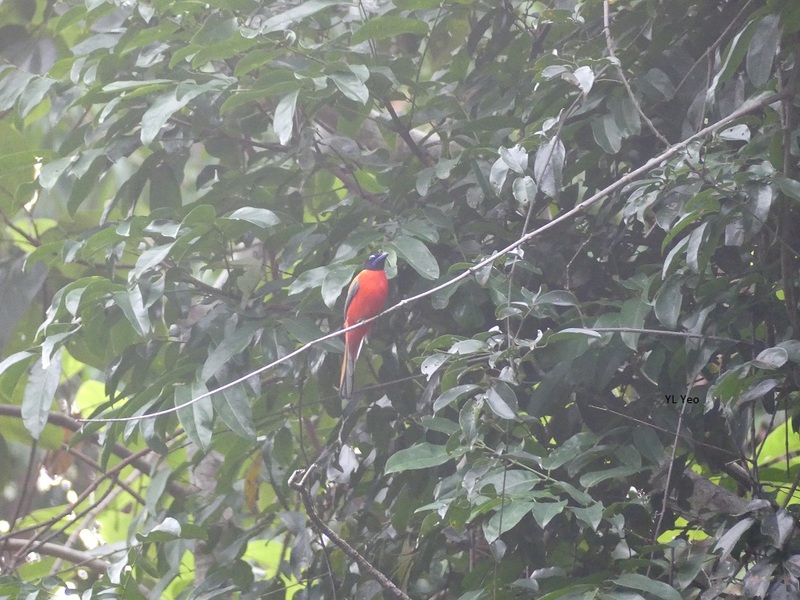 Ang called out this bird and we scrambled out of his four-wheel Isuzu to get a closer look of this trogon. 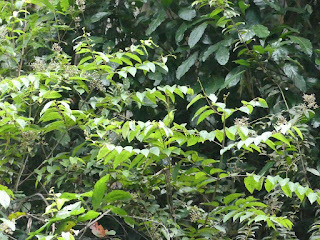 There was a good supply of caterpillars in the forest of Kuala Pilah. The Ruby-Cheeked Sunbird was seen constantly feeding on these caterpillars. The Rufescent Prinia and Stripe-throated Bulbuls were some of the birds seen earlier in the morning. We heard the owl calling out just as we were about to exit the Kuala Pilah forest and reservoir. 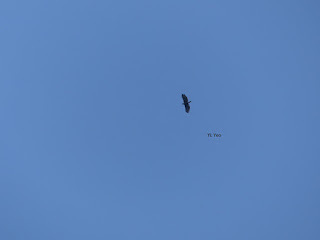 It was already 7pm at that time. We would have loved to stay on and to catch a sight of this mystery owl. 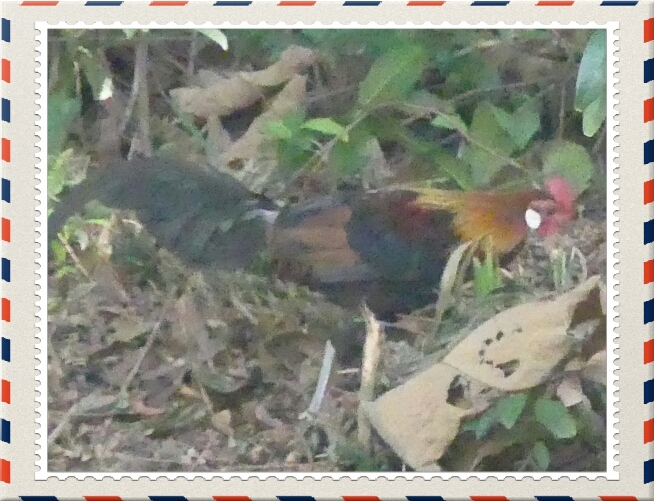 However the journey back to Malacca and Segamat, Johor could not be delayed any longer. 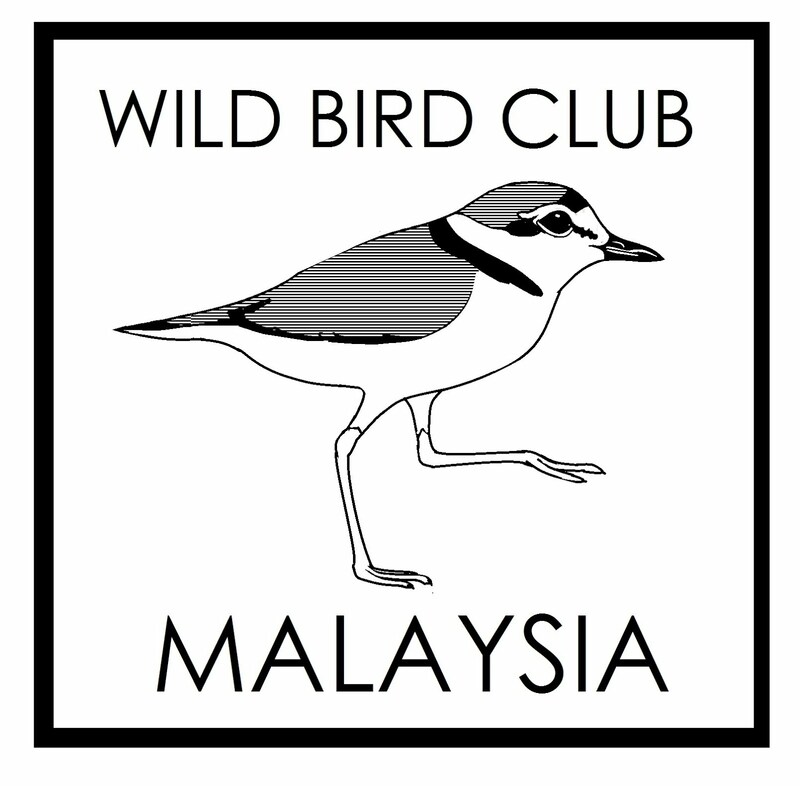 The exact identity of the owl, as such, remains a mystery and we took its hooting calls as a goodbye sign (as well as a "See you at Kuala Pilah forest on another day"). 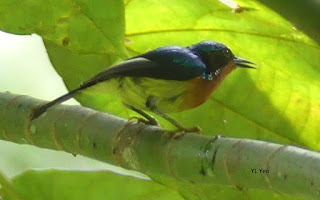 Ruby-cheeked Sunbird was flitting about that Saturday at eye-level. 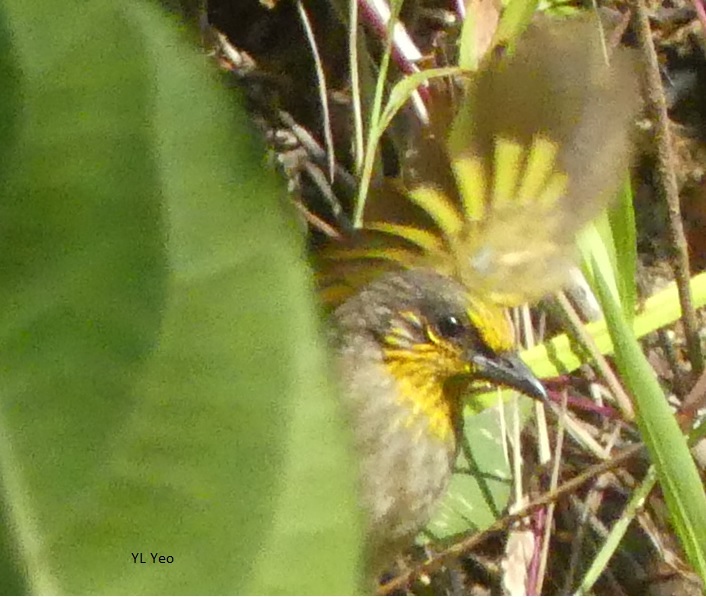 This sunbird gave us a wonderful photography treat. 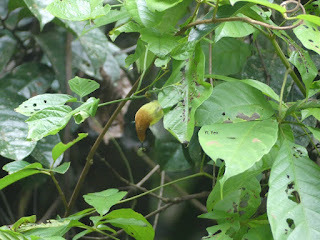 It was feasting on what looked like caterpillars amongst the foliage. 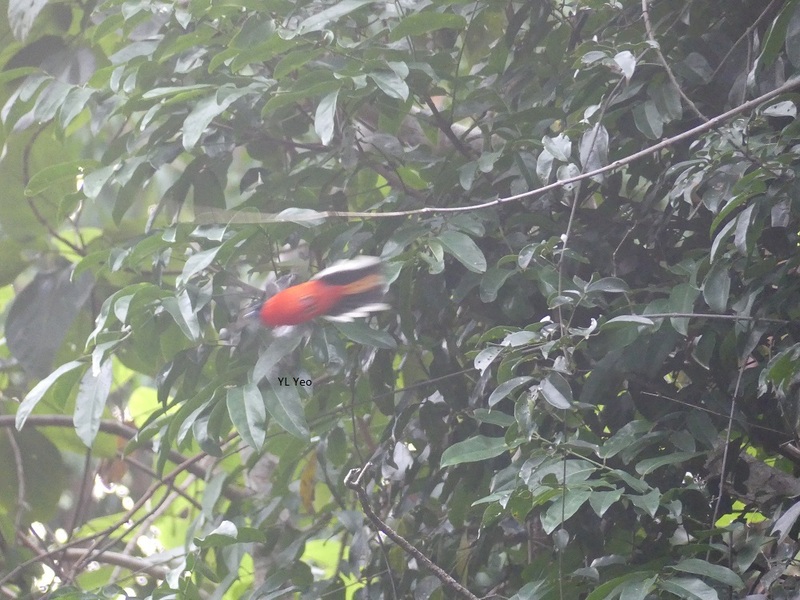 The sunbird performed some neat acrobatics when feeding. 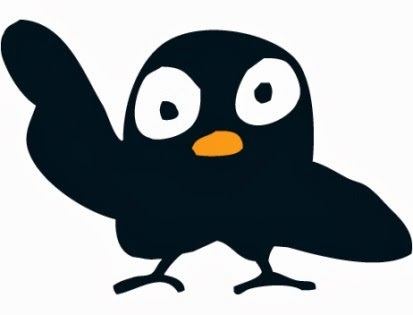 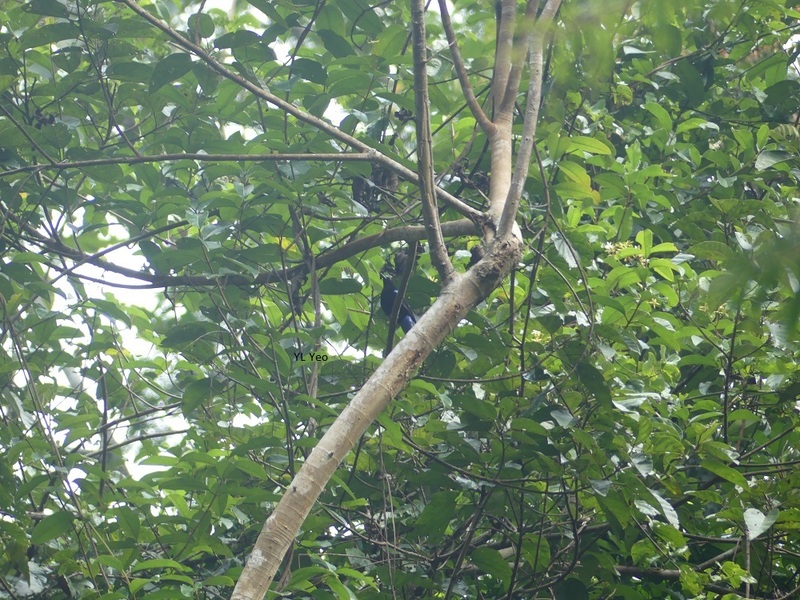 Asian Fairy Bluebird appeared for a few minutes before disappearing into the forest. 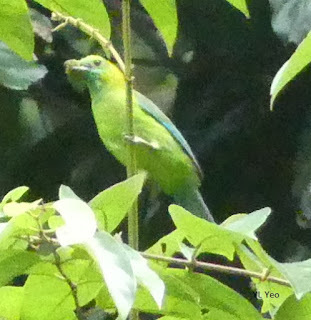 Blue-winged and Lesser Green leafbirds were very active late that afternoon in the forest. 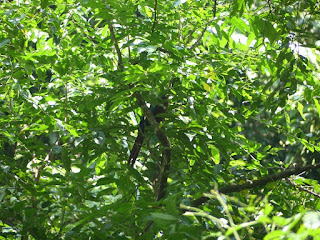 Blue-winged leafbird was particularly busy, carrying nesting materials in its beak. 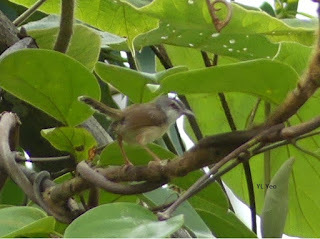 Babblers and bulbuls were also out and about, at around the same time as the leafbirds. 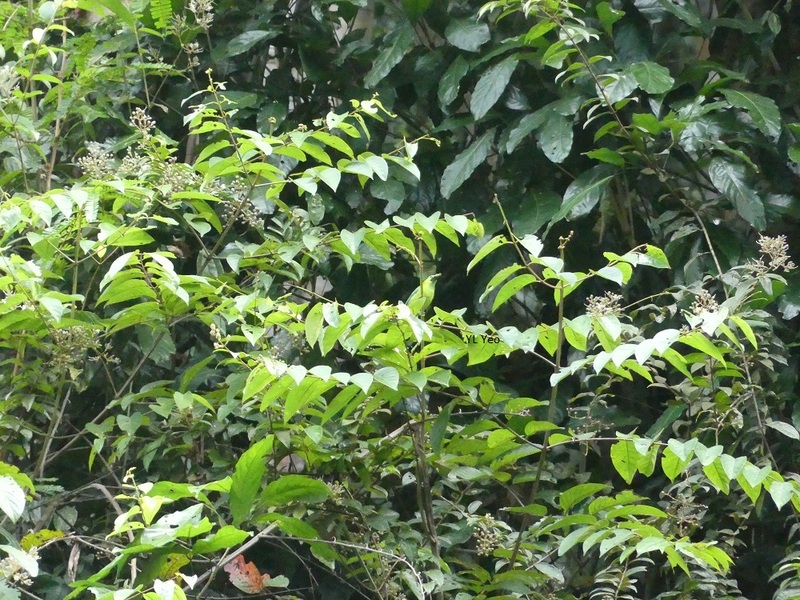 This patch of forest where the birds congregated, had a flowing stream. 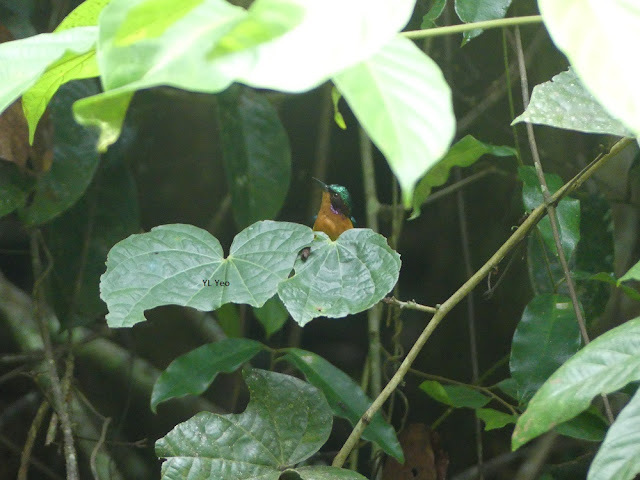 Ang had earlier spotted the Forktail hopping about the rocks along the stream. Woodpeckers were calling out from within the forest of Kuala Pilah. 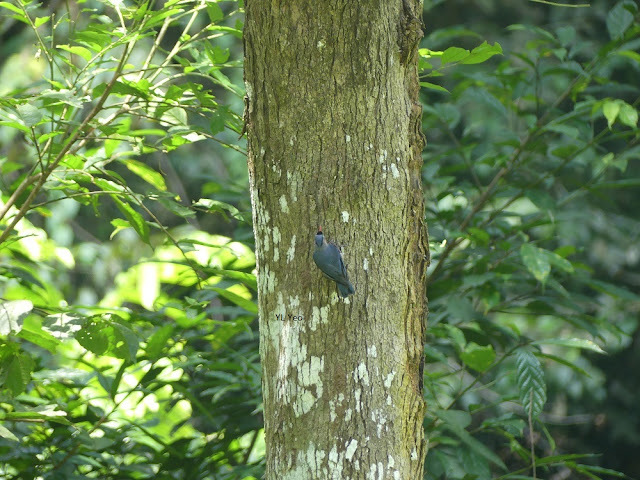 Something flew onto the trunk of a huge tree, which we initially thought was a woodpecker. 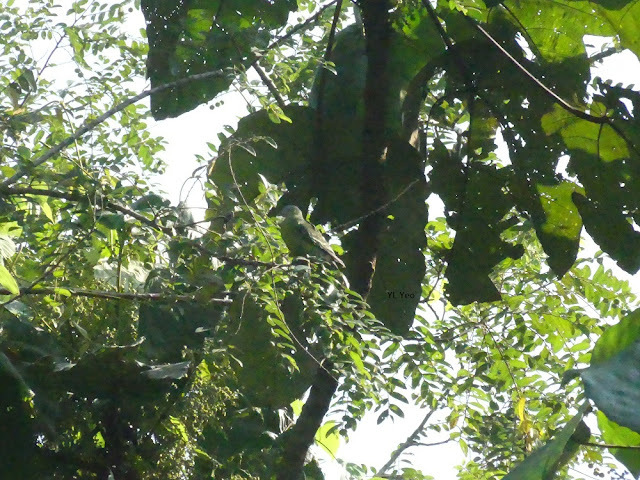 Turned out the flying creature was a Flying or Gliding Lizard (Genus: Draco). This Flying Lizard had a yellowish dewlap beneath its neck. 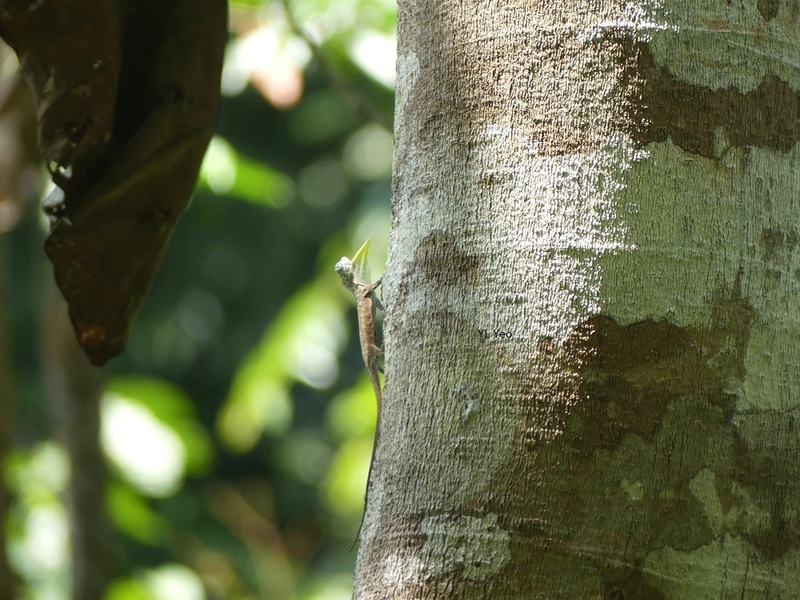 There are more than 40 species of Flying Lizards, with majority found only in Southeast Asia, according to website of Ecology Asia. 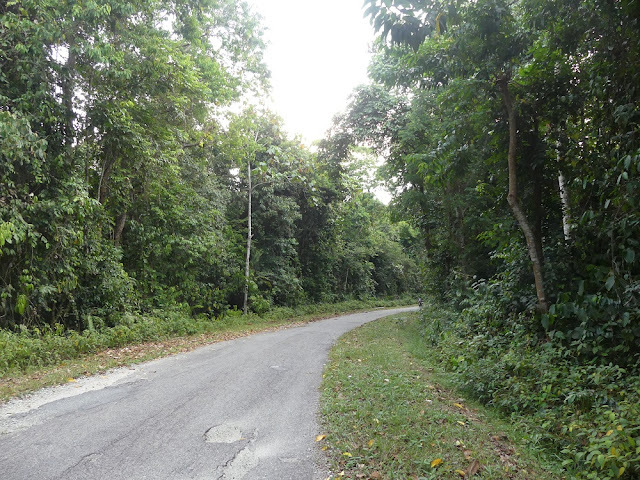 A pick-up truck half-filled with bunches of petai drove up the tarred road and parked near the dirt road entrance to the Orang Asli settlement. 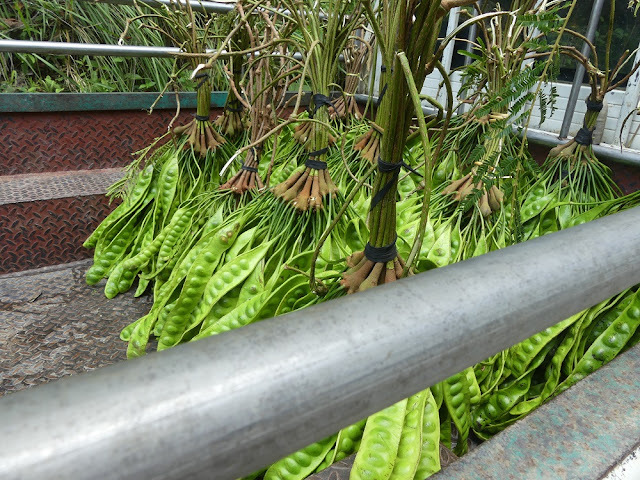 It was about to be filled up with freshly picked petai from the forest, which the orang asli transporting these, through their motorcycles. They drove out from the dirt road ferrying these fresh supplies of petai. 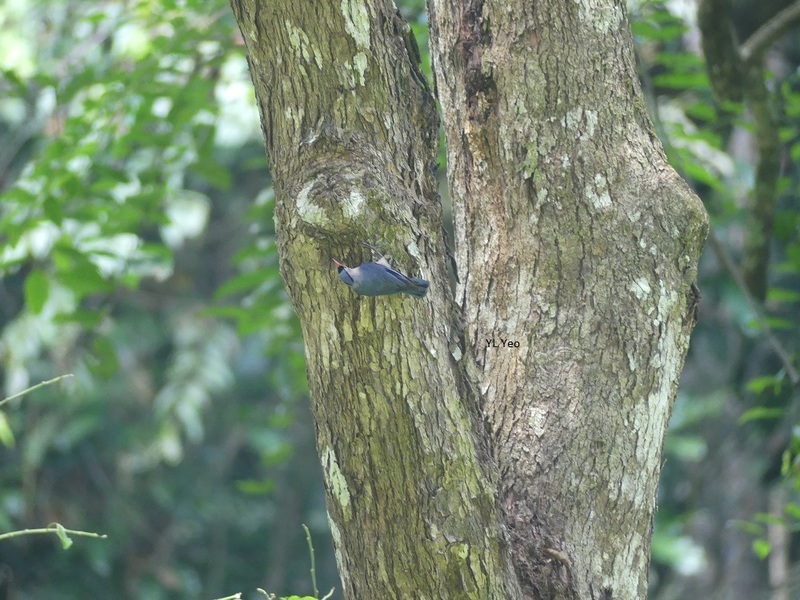 Challenging trying to snap a few good pictures of this fidgety Velvet-fronted nuthatch. Crested Serpent Eagle soaring above the forest canopy. 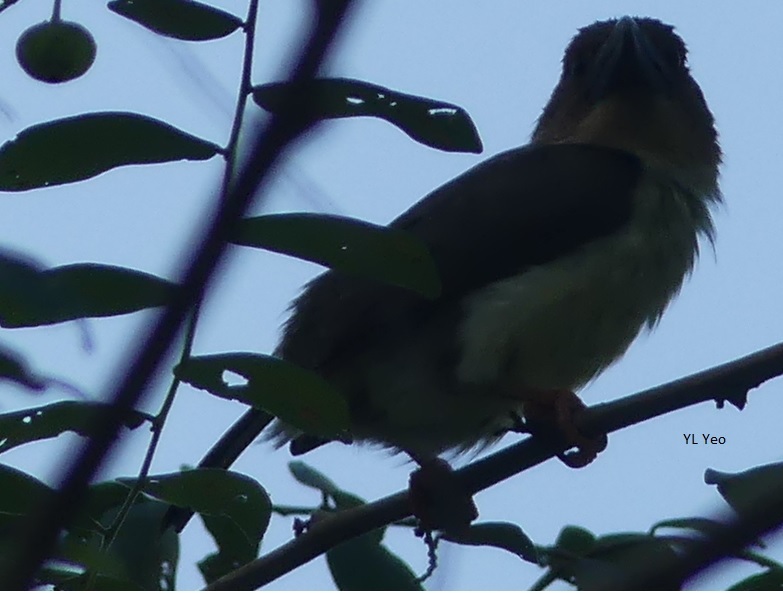 Chestnut-Bellied Malkoha looks like it was hunting for nesting materials that Saturday afternoon. 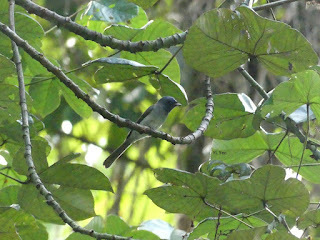 Malkohas (which were all over the forest that day) flew quite gracefully from tree to tree, with its tail almost as long as its body. Black and Red Broadbill's appearance made it the third Broadbill species to be seen at Kuala Pilah forests and reservoir that Saturday for us. 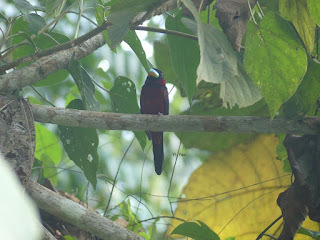 This broadbill had a rich coat of deep red and black. 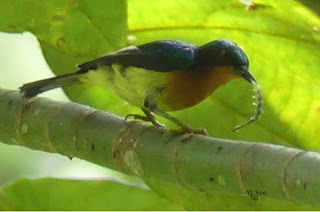 Its blue iridescent beak made it look so distinctive. 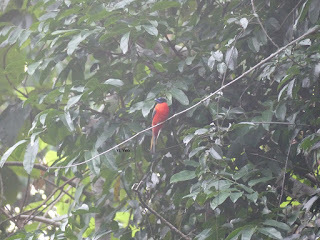 Such a pleasant sight indeed! 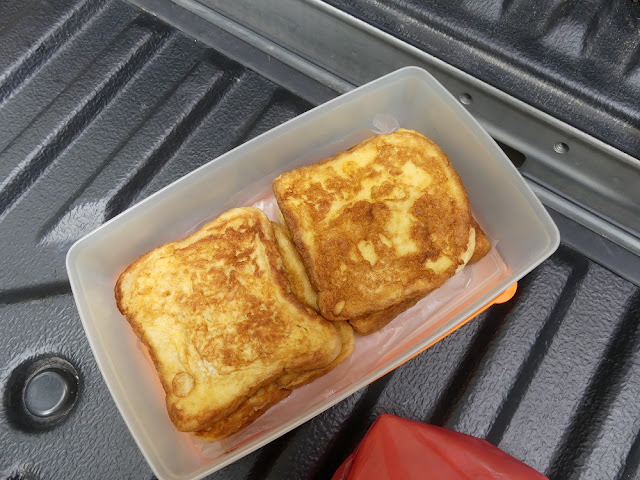 French toast for our afternoon tea, tasted extra delicious by the forests of Kuala Pilah. 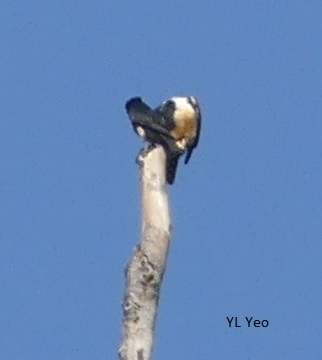 Black-thighed falconets, three (3) of them were spotted that Saturday morning on top of tree with dead branches. 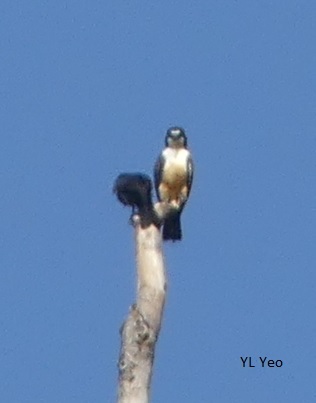 Initially spotted a pair of the falconets (see picture below). 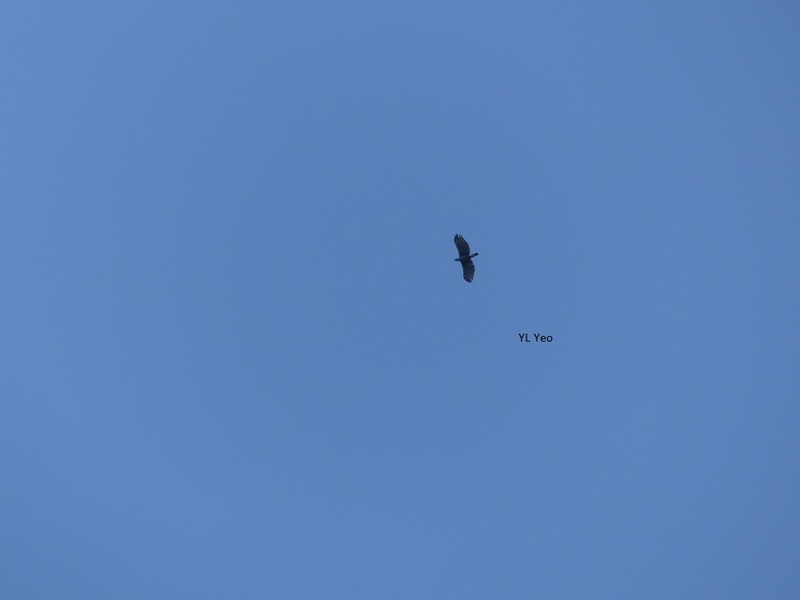 The third falconet flew in much later and was perched right behind the second falconet (see pictures above). 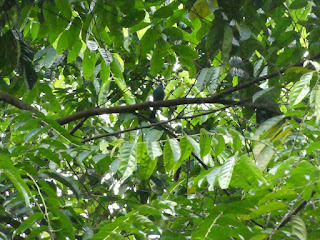 Also saw a Greater Racquet-tailed Drongo perched on tree opposite the road, with one of its tail missing. 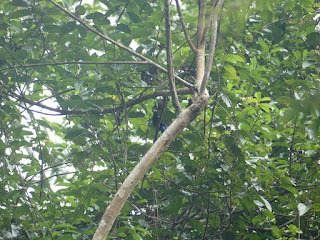 Gold-Whiskered Barbet was pecking away at a big hole of another tree nearby the Drongo. Cream-vented bulbul was feeding in the same tree as the flock of Little Green Pigeons. 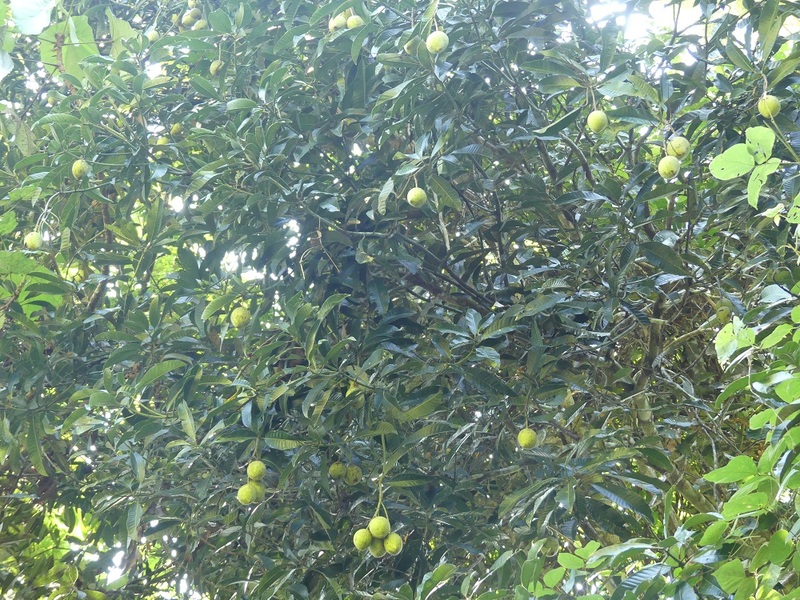 Further along the road, we spotted a tree laden with quinine fruits. We headed uphill towards the Orang Asli settlement. 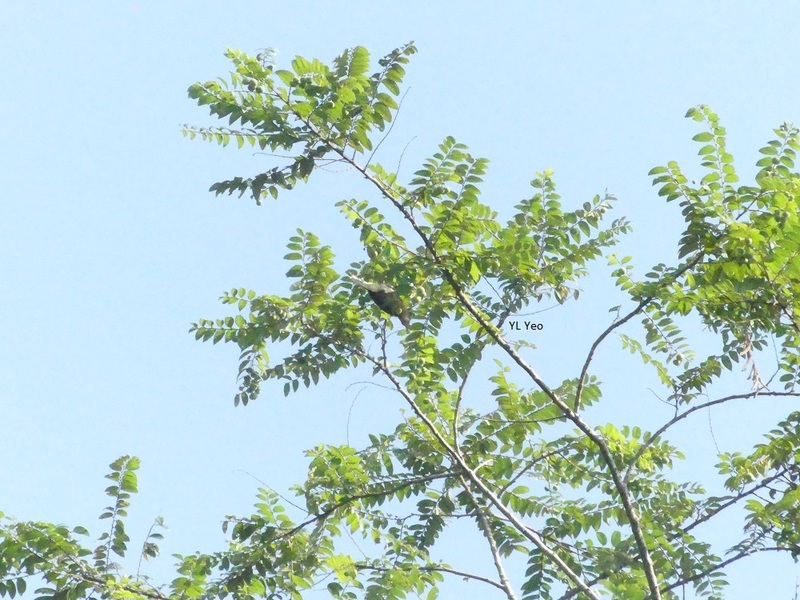 Sooty (Brown) Barbets were hopping about in a tree below. 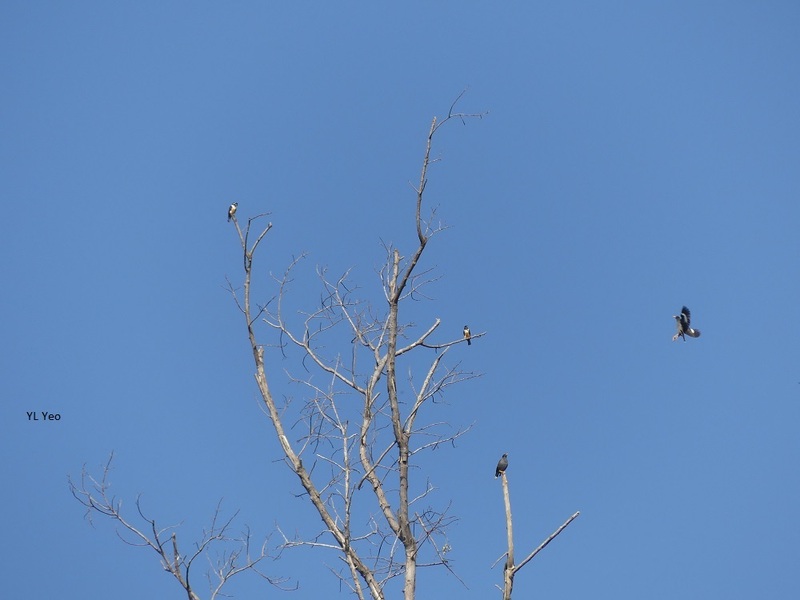 It looked to be the same fruiting tree in which the flock of Little Pigeons had been feeding on earlier downhill. 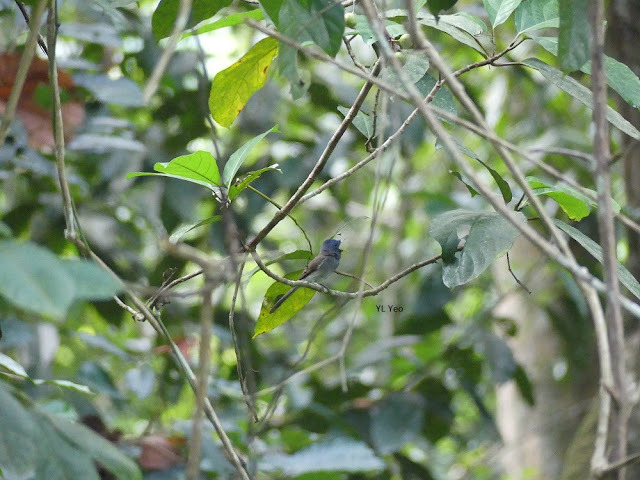 Verditer Flycatcher was also out and about that Saturday mid-morning in the forests of Kuala Pilah. Black-naped Monarch was very vocal that morning. 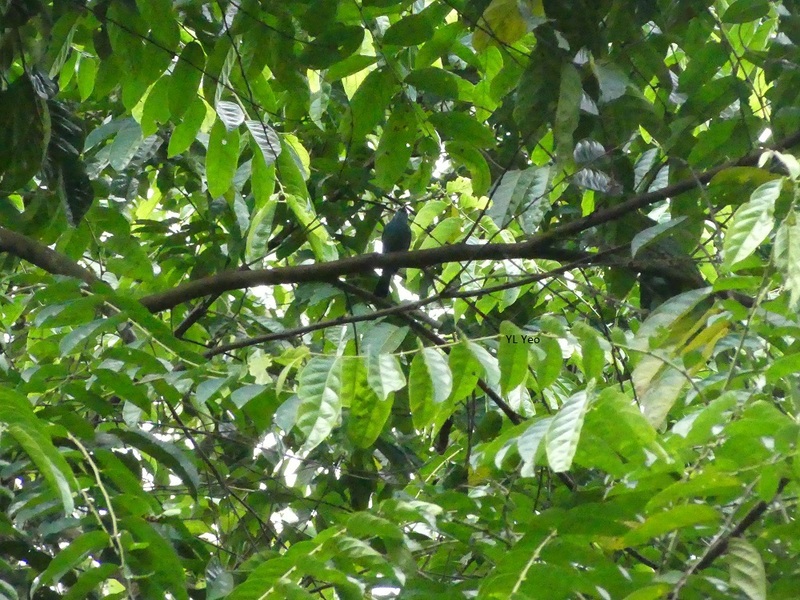 Singing away on the branch below. 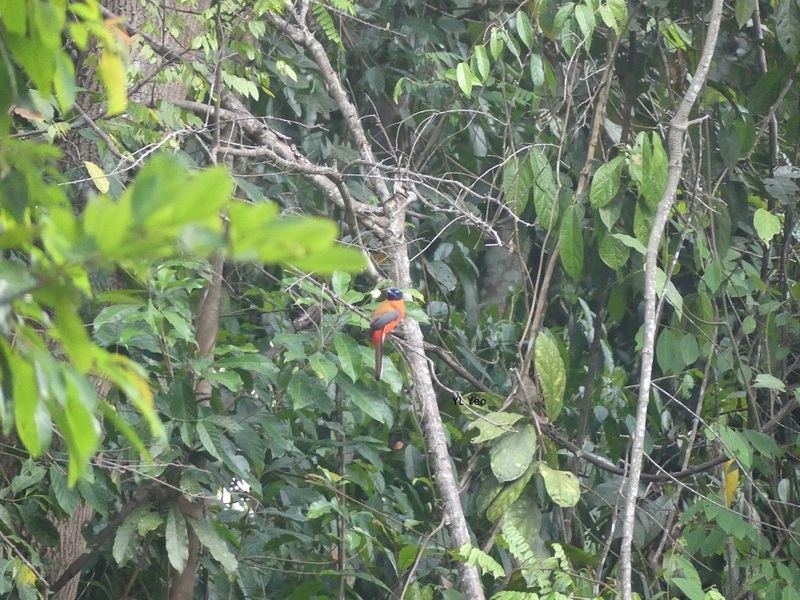 The calls of the Great Argus resounded throughout the forests of Kuala Pilah, Negeri Sembilan as we neared the dirt road leading to the Orang Asli settlement. 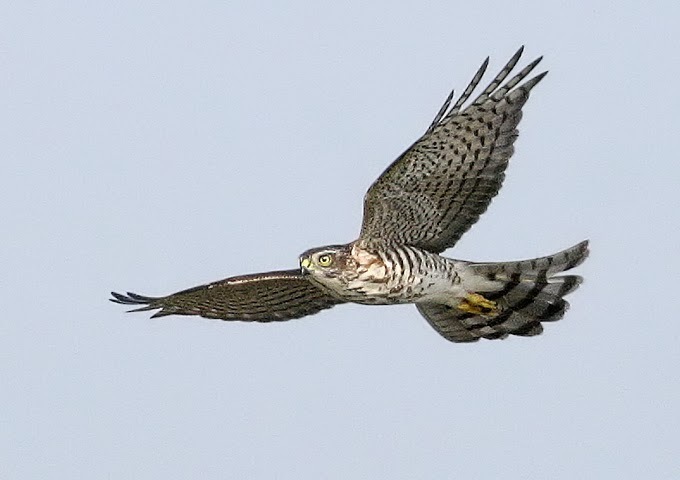 Heard the Great Argus calling again in the afternoon and evening. Flock of Little Green Pigeons were feeding in this fruiting tree when Ang, Raj and myself arrived for all day birdwatching at Kuala Pilah, Negeri Sembilan, Saturday morning. 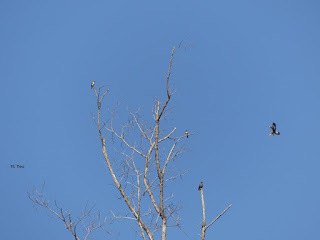 It was quite hot by 9am when we arrived at forests nearby the Reservoir. 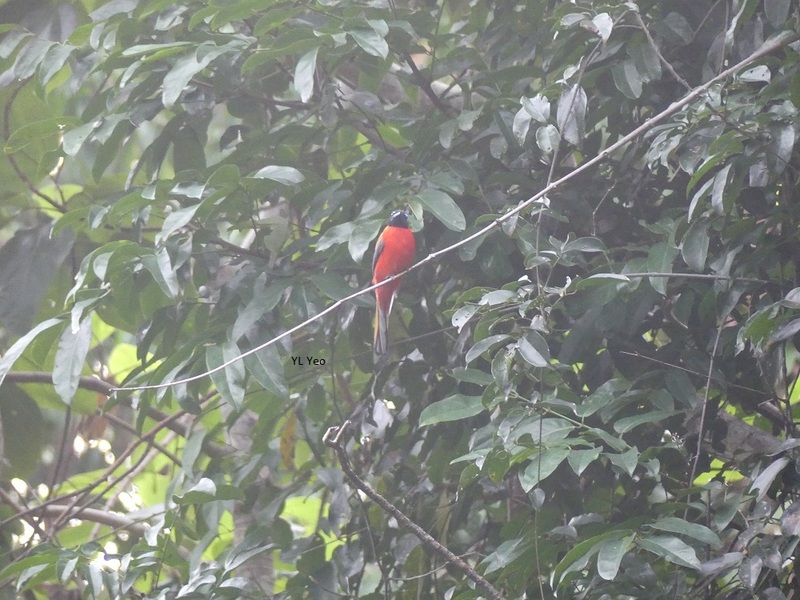 Tarred road made it easier for us to walk for short distances when birding. 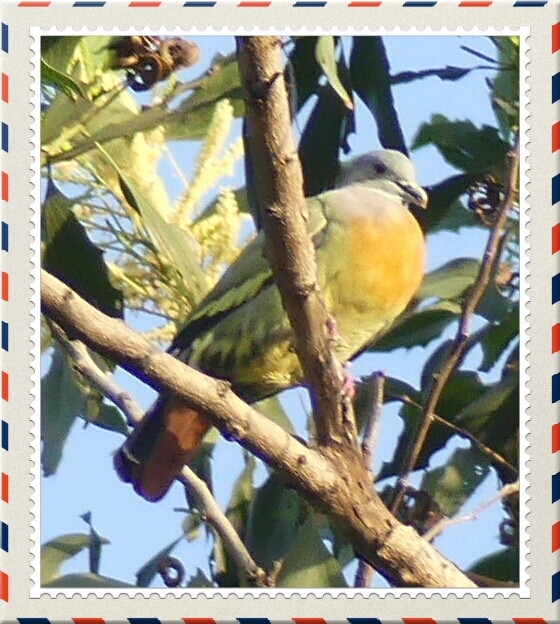 The male Little Green Pigeon has such a striking orange colour on its breast with greenish underparts and deep maroon-coloured wings. 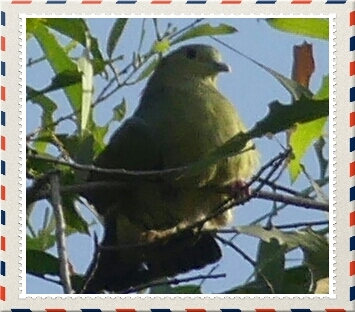 Female Little Green Pigeon is all green with lighter maroon wings. 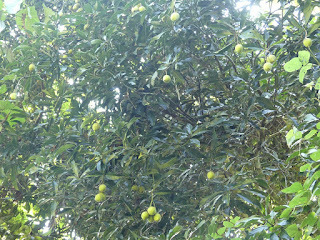 Fruits were green pouch-like berries which also attracted Cream-vented bulbuls to this same tree. 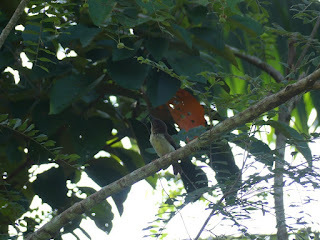 Also seen were Red-eyed bulbuls and Buff-vented bulbuls. 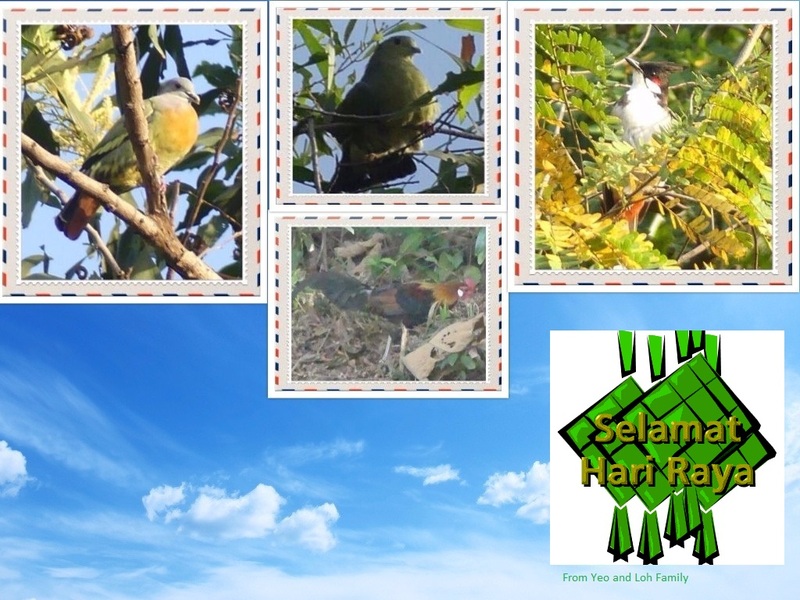 Really loved observing this flock of Little Green Pigeons feeding together with the bulbuls in this fruiting tree but it was time to move on towards the Orang Asli settlement. 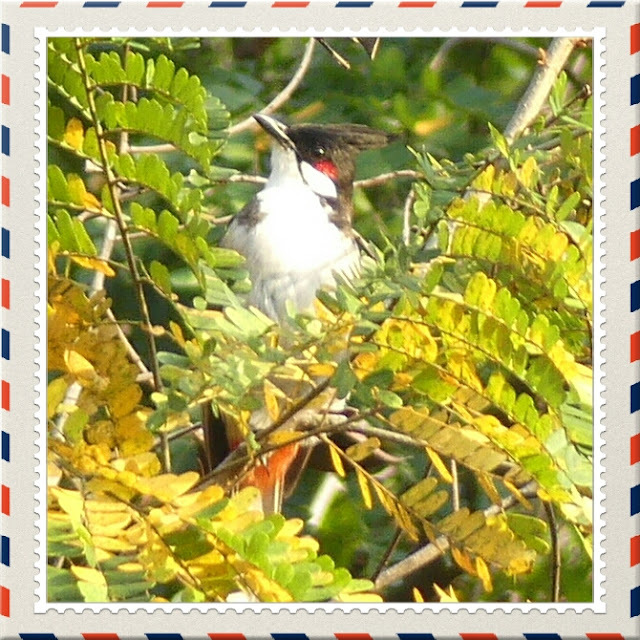 Red-Whiskered Bulbul. 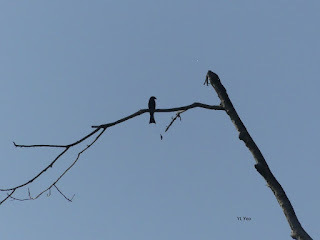 Two seen that Saturday morning. 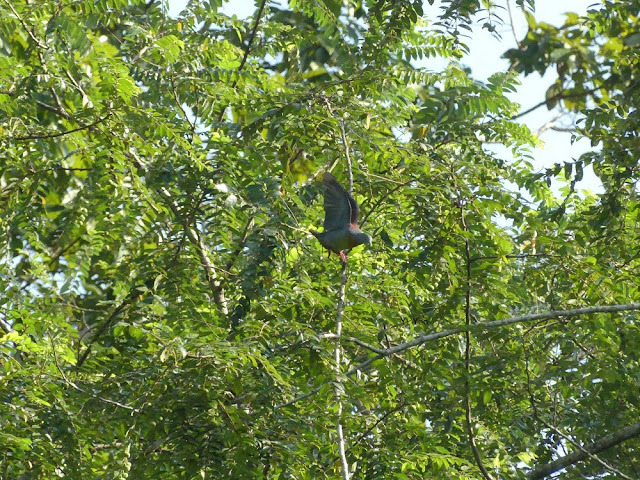 Pink-Neck Green Pigeon (Male) which rested for a long time on this tree before making a return trip to the fruiting fig tree for second (maybe even third) helpings of fruits. 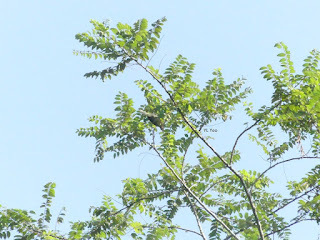 Flocks of green pigeon that Saturday morning. 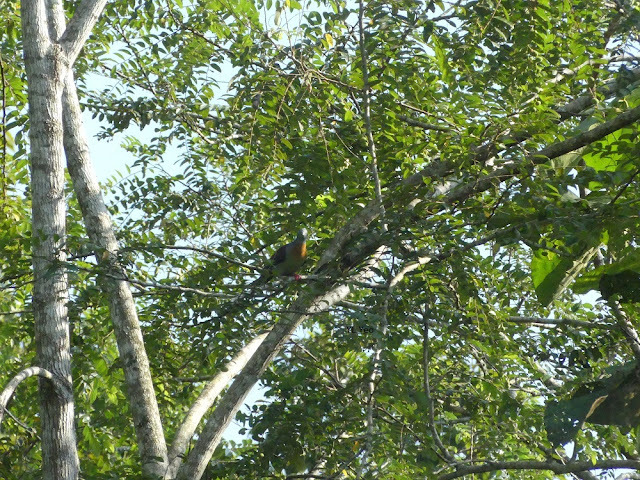 Couldn't locate the Jambu Fruit Dove that day amongst these flocks. Red junglefowl strutting its stuff along the slopes of a small hill in this vacant lot. 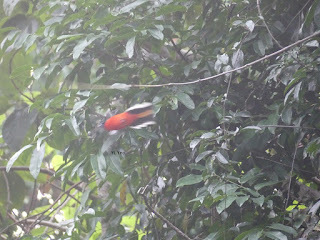 It walked upwards and disappeared from our sight within minutes. 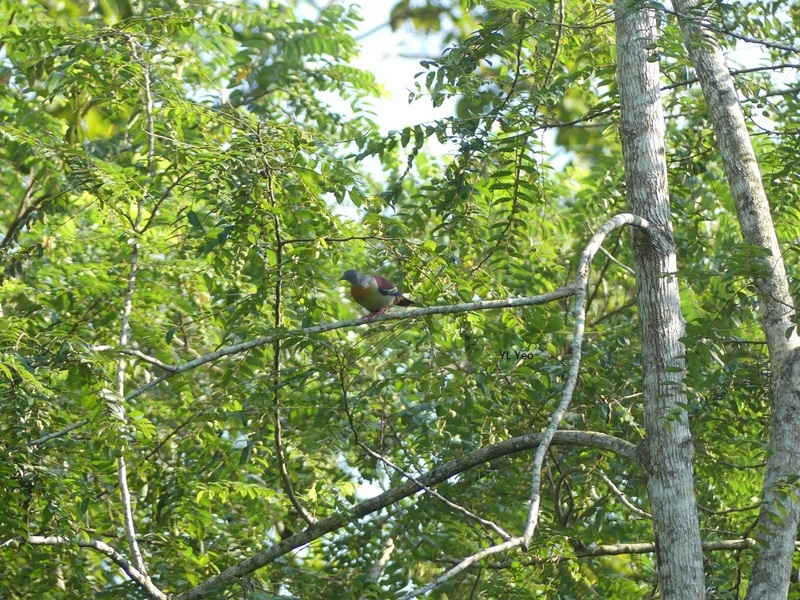 Pink-Neck Green Pigeon (Female) was amongst the flock of green pigeons. 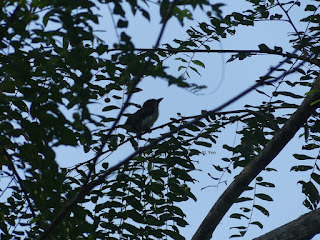 Residential Bungalow owners John and Joanna kindly allowed us to birdwatch within the gardens of their home in Taman OUG Kuala Lumpur. 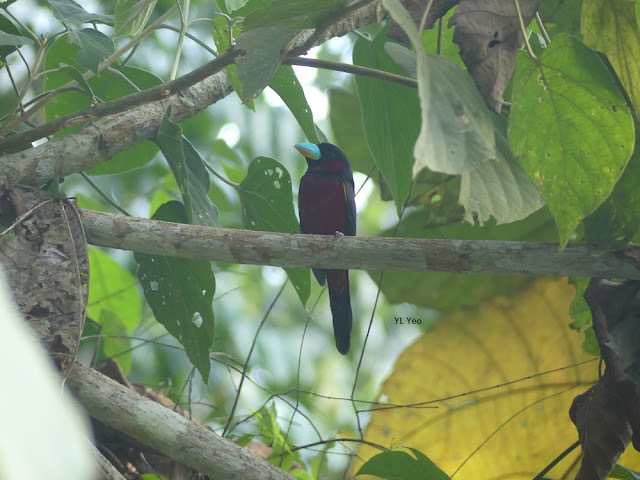 Their residence overlooked a vacant lot where a fruiting fig tree was attracting birds like bees to a honey pot.